Big Green Egg Kamado Grill MiniMax Portable Outdoor Smoker barbeque BBQ by BIG GREEN EGG at Freedom from Government. MPN: 2BGE-AMXHD1-MINIMAX. Hurry! Limited time offer. Offer valid only while supplies last. Fulfill your wildest BBQ dreams with the Big Green Egg. This modern-day marvel was derived from an ancient clay cooking device known as the kamado. Fulfill your wildest BBQ dreams with the Big Green Egg. This modern-day marvel was derived from an ancient clay cooking device known as the kamado. The EGG® produces amazing culinary creations-it grills, it smokes, it sears, it bakes-for novices and experts alike. Its unique design offers superior heat control and perfect results for restaurant-quality cuisine in the comfort of your own backyard. 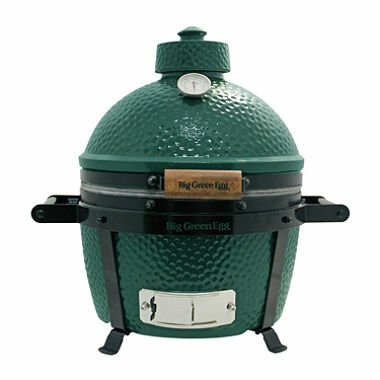 Sporting a stainless-steel cooking grid with a glossy green exterior, the Big Green Egg is built solid for years of tailgating and cookouts. Free shipping (if noted above) is available within the continental U.S. only. Offer excludes Alaska and Hawaii. Shipping to AK or HI adds a location surcharge to the regular rate. Delivery estimates, taxes, and fees are based on ZIP Code. Grid diameter: 13 in. Cooking area: 133 sq. in. Height: 19.5 in.